Today, I am part of Litfuse's blog tour for Stealing the Preacher by Karen Witemeyer! I've said it before, but I'll say it again: Karen knows how to write sweet romances. Stealing the Preacher was just that! If you've already read any of Karen's previous books, you won't want to miss it - you're in for another treat! I think my favorite of Karen's so far is Short-Straw Bride, but Stealing the Preacher would be next in line! I thought it was great that Karen told Crockett's story – one of the brothers from Short-Straw (but don't worry if you haven't read it; although the brothers are mentioned, Stealing the Preacher can be read as a standalone, and you won't be lost). Whoever heard of stealing a preacher? Jewels, perhaps; money, of course! Kidnap a ransom-valuable person, maybe...but a preacher?! What a creative start to a story! I loved the theme that God works in mysterious ways – and all things work together for good for those that love Him! 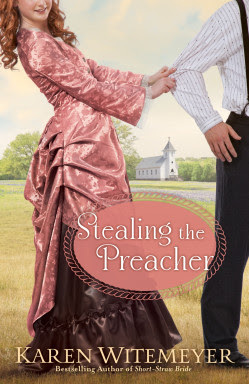 If you enjoy prairie-style romance, Stealing the Preacher is worth the read! That's what I thought! CLICK HERE to see what other Litfuse reviewers are saying! Thank you to Karen and Bethany House through Litfuse for sending me a copy to read and review!